Erica Bunker | DIY Style! 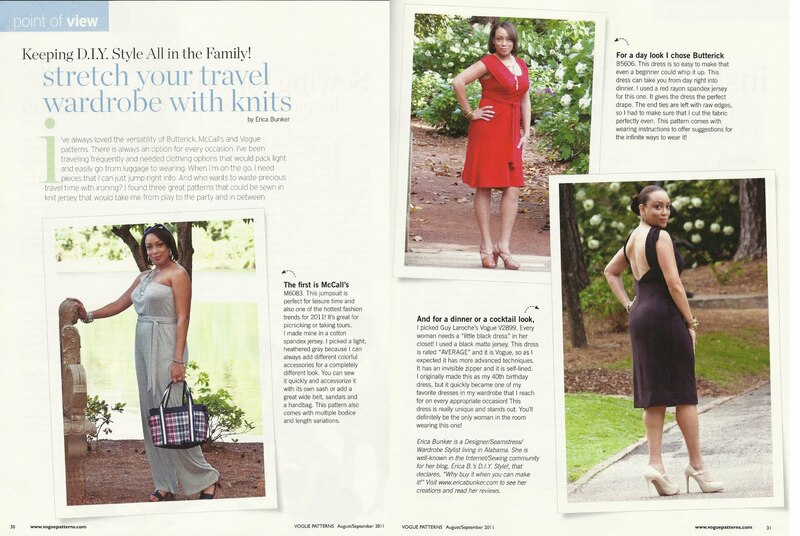 The Art of Cultivating a Stylish Wardrobe: Erica B. is getting some press! 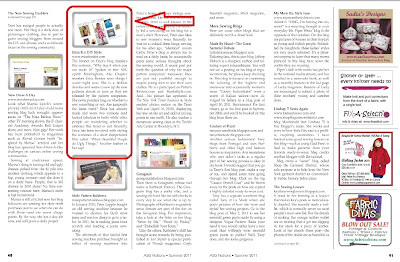 This article entitled "The New Sewing Enablers" features just about everyone on my blogroll. If you are an ASG member, you can access this online now. That's fantastic! Congratulations! It's lovely to see someone from our community getting the attention she deserves! Congratulations! Well deserved press Erica. I saw the spread in Vogue Patterns magazine when it arrived the other week - beautiful! I'll look forward to the ASG Notions. That's awesome! Congratulations, you deserve it! How wonderful for you. Having someone in the know notice your efforts is the best. Congrats! You really deserve it! I subscribed to Vogue patterns because they featured you. Thanks for pointing out the ASG article! I might have missed seeing my blog listed there too. Many, many congrats to you! Congratulations!! You so richly deserve the press. Way 2 go Erica ! Congratulations ! Vogue Patterns just got another subscriber. Yay for you! You deserve the light too! I really enjoyed the article in Vogue, looking forward to reading the ASG one. Congrats. Fantastic! How exciting for you (and for all of your loyal readers)! Can't wait to see what's next for you. Yay! You so deserve it, bombshell girl. Congratulations! The press is well deserved! good for you! you definitely deserve it. ERICAAAA! That is crazy mad fantastic! I get advanced copies as an advertiser, and I saw you in there. Congratulations!!!! So well deserved... wonderful ! This is well deserved press and success for you! I knew the first time I read your blog that great things would come your way. Congratulations! Congratulations! You are great at what you do and deserve it. Congratulations! This is definitely deserved. So proud of you. I have read you for years and this is well deserved! Awesome and so well deserved! The ASG Notions magazine arrived this week, and I saw the article. Well done, Erica! Congratulations!! I was featured too, I'm just waiting for my copy to arrive on the mail!